The annual D&AD award winners have been announced with a ‘Yellow Pencil’ going to an interesting campaign by Tokyo-based agency Hakuhodo for snack food client Tohato. 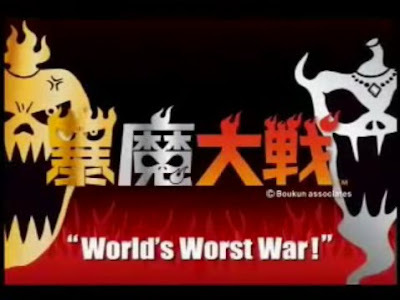 The World’s Worst War used two new spicy snack flavors as opposing forces and engaged players to invite friends, thereby increasing their own personal rank, to join forces of either the Habanero Evil Army or the dreaded Satan Jorquia… Yikes. Better to watch the video! Tomi has interesting post on this here. E-MBMS is out of Release 8 and CBS (Cell Broadcast Service) is back in LTE. CBS as far as I am aware is not used much anywhere except Japan. 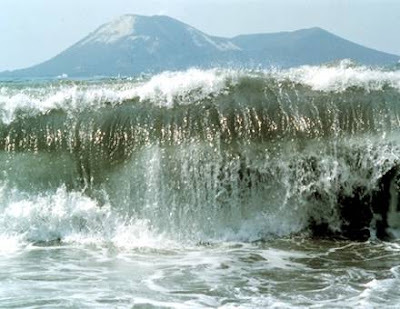 CBS has been added specifically as now there is requirement for EWTS (Earthquake and Tsunami Warning System) . Finally, probably because of threat from WiMAX, LTE vendors have announced a mutual commitment to a framework for establishing predictable and more transparent maximum aggregate costs for licensing intellectual property rights (IPR) that relate to 3GPP Long Term Evolution and Service Architecture Evolution standards (LTE/SAE). The companies invite all interested parties to join this initiative which is intended to stimulate early adoption of mobile broadband technology across the communications and consumer electronic industries. The framework is based on the prevalent industry principle of fair, reasonable and non-discriminatory (FRAND) licensing terms for essential patents. This means that the companies agree, subject to reciprocity, to reasonable, maximum aggregate royalty rates based on the value added by the technology in the end product and to flexible licensing arrangements according to the licensors’ proportional share of all standard essential IPR for the relevant product category. Femto++: This term was used by Airvana to refer to enterprise femtocell. They also refered to it as eFemto. Cognitive Radio Femtocell: This was referred by Ubiquisys. I was really impressed with this one and will write a blog later on this one. Ericsson has a press release saying that Dell will use its high-speed HSPA mobile broadband technology in next-generation laptops due in the second quarter of 2008. 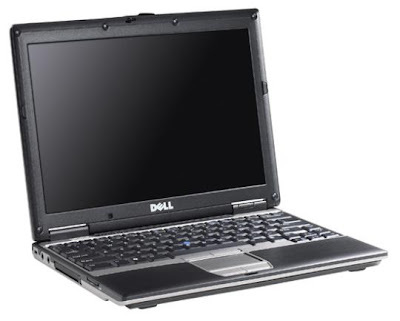 The modules will be built in to the Dell laptops, according to a press release by both companies. By June, Intel is expected to roll out its next-generation "Montevina" mobile chipset, which will be used as the foundation for the next generation of Centrino notebooks. Although Montevina was expected to usher in the next-generation WiMAX technology, the apparent delays underlying Clearwire's WiMAX rollout may have pushed Dell to seek an alternative broadband choice. According to a Dell spokeswoman, the choice to include Ericsson's HSPA technology was as much about compatibility as throughput. If a customer takes a 3G-enabled laptop with him or her to Europe, it might work, "but it's not a seamless transition," Dell's Anne Camden said. The HSPA technology is more uniform throughout the globe, she said. But it's also true that Dell wanted a broadband solution now. "Mobile broadband delievers a broadband experience today, and that is what we need," Camden said. "We want to deliver a great broadband experience. We're certainly looking at WiMAX support in future products." Dell is the second major PC vendor to sign on to use Ericsson's HSPA technology, after Lenovo. According to Ericsson, both Dell's business customers and consumers will use the new modules. Interestingly, Ericsson built in a GPS component into the HSPA modules, meaning that location services will be also be built in. Winners of Sweden's 2.6GHz spectrum auction can now look to rapid deployment of advanced mobile networks, with Ericsson poised to deliver end-to-end HSPA and LTE technology. The auction is the first held in the world to license according to the harmonized band arrangement decision by the European Conference of Postal and Telecommunications Administrations (CEPT). As a front runner in allocating the 2.6GHz frequency band, the regulator Swedish Post and Telecom Agency has adopted a harmonized spectrum allocation as defined by CEPT. The allocation will facilitate economies of scale for operators and secure the availability of standardized terminals, allowing roaming between countries for users. Auctions of the 2.6GHz band in Austria, Netherlands, Italy and the UK are scheduled for 2008. LTE and HSPA, the preferred technologies for the 2.6GHz band, enable a superior, mass-market user experience, enhancing demanding applications such as mobile video, blogging, advanced games, rich multimedia telephony and professional services. Ericsson's solutions help operators leverage their network investments by providing optimal voice communication and mobile broadband services. Ericsson employs scalable architecture and allows seamless network expansion, providing an efficient migration path to broadband, regardless of the legacy technology in place. Ericsson's offerings for the 2.6GHz band are based on its multi-standard RBS 3000 and RBS 6000 series. These energy efficient base stations support WCDMA/HSPA/LTE and GSM/EDGE/WCDMA/HSPA/LTE respectively. Ericsson's RBS suite offers the smallest base stations on the market and facilitates low-cost migration and easy network integration. HSPA is already commercially deployed in more than 185 networks in 80 countries, with more than 600 devices launched. This one is from Dean Bubley's Disruptive Wireless Blog. 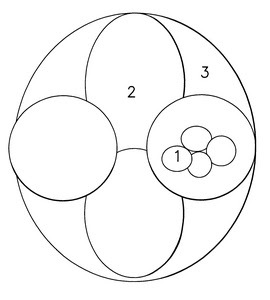 Now I was under the impression that the network operators have already deployed multiple frequencies and have a hierarchical arrangement as in the diagram above. This may not be exactly true as according to Dean's post it seems that only now the operators are looking at this option. Surely the people already involved in field testing can tell us if they are seeing Inter-frequency measurements and if they are wouldnt this indicate multiple frequencies? My thinking was that when the operators rolled out HSPA they kept the HSPA part on one frequency and they let the existing 3G on the original frequency. This helped them keep everything smooth without worrying too much about the code tree management. Secondly, it means that operators will need to get extra spectrum if they're serious about continuing to drive mobile broadband. 2.6GHz is the obvious big chunk, but refarming 900 and 1800MHz GSM starts to take on more urgency ( as well as expediency for coverage reasons). Lastly, it means that operators are going to be faced with some unpalatable choices in terms of capex for HSPA - having to choose between fulfilling the need for extra 5MHz carriers in high-use areas, versus continuing 3G build out in areas with no coverage at all. I suspect that this is going to drive a lot more emphasis on EDGE - and EDGE Evolved, as an interim coverage solution in marginal areas, as it wring more life out of existing 2G base stations. Interestingly, the GSA has been talking up EDGE today as well. I am going to try and digup some information on UK operators on the frequency usage as this may probably help understand about the situation better. U.S. mobile technology company Qualcomm Inc. (QCOM) said Friday that it acquired an L-band radio spectrum licence for GBP8.3 million that will enable it to bring new mobile TV and wireless services to the U.K.
Qualcomm U.K. Spectrum Ltd bought the licence to use 40 Megahertz of the 1452 MHz to 1492 MHz band in an auction by communications regulator Ofcom. The licence is suitable for offering mobile television, wireless broadband and satellite radio, Ofcom said. The L-Band spectrum license acquired by Qualcomm covers the entire United Kingdom and is technology neutral, thereby enabling Qualcomm to use the spectrum for innovative technologies, depending on its assessment of market needs in the United Kingdom. 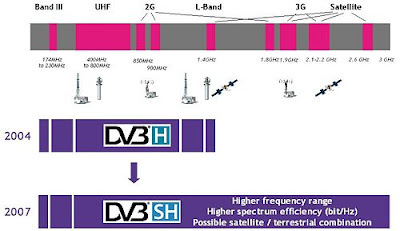 The L-band, on which any technology or service can be used, will contend with two main rivals, DVB-H, backed by Nokia, the handset maker, and by Viviane Reding, the European Telecoms Commissioner, who wants to make it the European standard, and TDTV, which is being tested by Orange and T-Mobile in the UK. All three technologies would require special handsets able to pick up a broadcast signal. Mobile companies including Vodafone and 3 already offer mobile television in Britain, but take-up has been poor. Qualcomm said that it does not intend to run a mobile TV broadcasting network as an operator, as it has done in the United States, but is looking for partners to launch its mobile television technology, MediaFLO. Andrew Gilbert, head of Qualcomm's European operations, said: “We will not attempt to become an operator, but if service providers want to partner with us ... we are open to talking to folk.” Mr Gilbert added that Qualcomm would use the spectrum to bring a variety of wireless technologies to the UK market but that it had no timetable for launches in mind. O2, the mobile network provider, was initially interested in the L-band auction, but pulled out without bidding. Failed bidders include WorldSpace, the satellite radio group, and The Joint Radio Company, which runs spectrum for the UK energy industry. The next competition, to run later this year, is even more significant. It has a price tag that could run into the tens of millions because it is for a frequency that supports WiMax, a high-speed network technology similar to a common WiFi home wireless system, but with a more robust signal and a range of a kilometre or more. Although WiMax is not new it has had little success so far. But interest is hotting up. In the US last week, Sprint Nextel announced a $14.5bn (£7.4bn) joint venture with Clearwire to build a network servicing as many as 140 million people by the end of 2010. And Google is pumping another $500m into the scheme. At the moment, the UK market is small. Freedom4 and UK Broadband, a subsidiary of PCCW, are the only providers with a national licence, and only limited services are available. But developments on the other side of the Atlantic are fuelling interest, and some big players are lining up for the relevant spectrum auction. Ian Livingston, who takes over aschief executive at BT in two weeks' time, has said thecompany is interested, and Vodafone has trials running in Malta. Freedom4 is also already in talks with potential investors about the £100m infrastructure funding it estimates it will need from 2009-11. 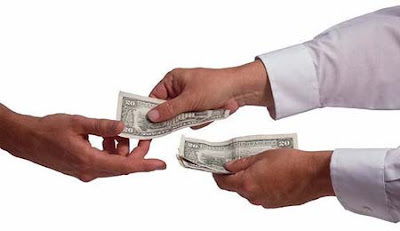 "We are talkingto our partners and the banks," Mike Read, chief executive of Freedom4, said. "Following the deals in the US, there is moreinterest in what we are doing over here." Ian Keene, a senior analyst at Gartner, said: "There is abusiness case for WiMax in the UK, but most likely it will becity-centric and focused on business, rather than nationalcoverage competing with mobile networks." The biggest auction of all will be next year's bidding for the "digital dividend" – the wide bands of frequency freed up when the analogue television signal is switched off in 2012. The debate about who should get what is already well under way. Broadcasters claim a substantial portion for high-definition TV, mobile operators want it for next-generation cellular services such as video, and internet service providers say it iscrucial for the broadbandinfrastructure. In the past year or so there has been lot of talks about the next generation wireless technology and the significance toward adopting these technologies. One of such technology which is very much a popular discussion these days is LTE. Over the last one year LTE air interface and its architecture has become clearer. Significant developments have been made in finalising the LTE architecture and OFDMA and SC-FDMA as radio access technology. LTE as a technology has a come long way in terms of finalising the air interface and other standards. 3GPP1 and 3GPP2 is working hard to get the latest specification out so that telecomms companies start drafting their plans in order to implement the technology. Giants like Nokia, NTT DoCOMO, Ericsson, Vodafone and others have already started their research and development on LTE thus giving enough indication that LTE is going to be the technology adopted by most as a next generation wireless technology. Long-term evolution (LTE) promises to make everything from mobile-video sharing to music downloads speedier, but it may not show a visible boost in sales for the network equipment industry any time soon, as the first networks are not expected for two years and many operators will wait longer until the technology matures. Verizon Wireless, the number-two US mobile service, has decided to build out an LTE network, while China Mobile, the world's biggest mobile provider, said earlier this year it would test LTE. Alcatel-Lucent and Japan's NEC signed a joint-venture deal to pool their development and marketing of the technology. Even Qualcomm has promised chips for LTE, a competitor to its own Ultra Mobile Broadband technology. Ericsson recently unveiled a glimpse of what the future of mobile Internet will bring, announcing its new M700 mobile platform, capable of LTE (Long Term Evolution) data transfer speeds. Ericsson says this is "the world's first commercially available LTE-capable platform", and we have no choice than to believe it, especially since the Swedish co mpany sustains the platform will bring data transfer speeds of up to 50Mbps (when uploading) and up to 100Mbps (when downloading). Sure, these speeds are not comparable with the ones achieved by NTT DoCoMo's Super 3G network (250Mbps), but they are obviously better than what the current 3G networks can offer. Moreover, these new speeds can surpass, in some cases, the data rates achieved by fixed lines, allowing the development of real-time mobile services, including video streaming and on-line gaming. Nokia Siemens has already achieved speeds up to 173 Mbps with LTE in a trial of the LTE wireless data network. The field trial was conducted in an urban environment and was meant to test the performance of LTE in "real" environments. This is in contrast to a demonstration of the technology a year ago that achieved speeds up to 160 Mbps. LTE technology is competing with WiMAX to deliver high speed mobile networks, and both have high profile supporters worldwide. The LTE project was designed to evolve the current 3G technology used today, and Erissson’s prototype together with the Nokia Siemens test shows clearly which camp the companies are in. There are others who like Ericsson putting a lot of efforts in LTE and thus making it clearer that they prefer LTE as compared to WiMax. During its first quarter conference call with investors, Alltel announced that it was committed to evolving its network to LTE over the next five years. The move makes Alltel the second biggest CDMA carrier in the U.S., after Verizon Wireless, to commit to the LTE standard, even though LTE was originally on the GSM evolution path. "We do currently plan to move towards LTE in the three-to-five year timeframe vs. WiMAX, but we're still early in that," President and CEO Scott Ford said during the call. Huawei Technologies ("Huawei"), a leader in providing next generation telecommunications network solutions for operators around the world, has already announced that it has joined the Long Term Evolution / System Architecture Evolution (LTE / SAE) Trial Initiative ( LSTI ) and will hold the infrastructure vendor seat of the 2008 LTE/SAE Trial Initiative Steering Board. The LTE/SAE Trial Initiative brings together major telecom vendors and operators, committed to driving the development of next-generation, high-performance, mobile broadband networks and 3rd Generation Partnership Project (3GPP) LTE and SAE technologies. Huawei's active in LSTI reflects commitment to contributing significantly to the development of HSPA, HSPA+ and LTE technologies, as a leading global telecommunication solutions supplier. Rohde and Schwarz is also not lagging behind in it’s efforts to make sure that its system simulators are available for the vendors when they are ready to test their first LTE device. By including the latest revisions of the 3GPP LTE standard in the firmware for its signal generators, Rohde and Schwarz is already offering highly flexible testing for LTE equipment. Rohde and Schwarz has added channel coding and MIMO precoding for up to four transmit antennas to its industry-leading signal generators for LTE (uplink and downlink) Whether mobile equipment manufacturers are looking for an all-in-one solution for 2x2 MIMO signals and real-time fading or simply need standard-compliant RF or baseband signals, Rohde and Schwarz offers the answer. Even though slow progress on MBMS (Multimedia Broadcast Multicast Service) has been going on for some time, just found out through sources that the two biggest promoters of this technology have put it on backburner. The reason they cite is the lack of interest from operators. They do not have a burning need for Mobile TV technologies as they are still able to cope with the demand by streaming point to point connections. Somebody told me on condition of anonymity that the big operators in UK are at a breaking point but the things are still surviving because in the peak hours (9am to 5pm) there is not much demand for Mobile TV and the voice occupies the complete bandwidth. Whereas after 7pm and before 7am there is an even distribution of data and voice services. In the buffer zone (7am to 9am and 5pm to 7pm) data is being given low priority and many data calls dont work. This would cause decent revenue loss except that most of the people on data plans have a flat rate package so it does not bother the operators. This is despite the announcement last month about Huawei and Qualcomm successfully completing their IOT with Telecom Italia. Orange and T-Mobile has been trialling MBMS based on TDtv technology but lets accept the fact that it is TDD-MBMS rather than the FDD-MBMS which other manufacturers like Qualcomm, Nokia and Ericsson are (were) actively working on. I read this blog some days back and it emphasised what I have been saying for years now that there will always be multiple technologies floating around. MBMS could be a starting point for Mobile TV but as the demand grows it will have to be supplimented by other specialised technologies like DVB-H, DMB-T, MediaFLO, etc, etc. 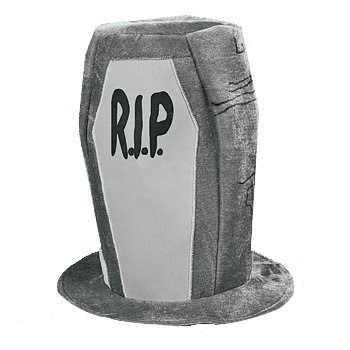 For the time being, rest in peace MBMS. Femtocell is in spotlight again for various reasons. In an earlier blog, I had expressed my doubts regarding femto cells but my opinion is changing after talking to some experts in this area. ABI Research has predicted that this year only 100,000 cells will be sold and but by 2010 the shipment will be tens of millions of units. 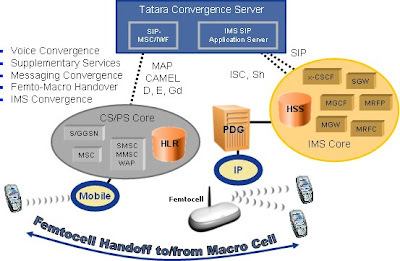 There are around 20 femtocell development underway. I saw this interesting blog on Femtozone services. I am sure providing these additional services in femtozone areas like sending SMS when kids are home or they leave home can be releif for parents. Many people have complained of the harmful effects of WiFi in their home or office will these complains increase? How much research has been done on the safety of these devices? Most of these will use IP backbones, I assume we need to have broadband for these, what speed of the connection is required? Will this have impact on the ISPs? 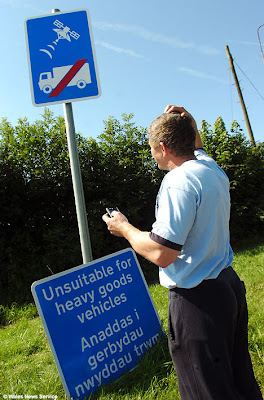 Would they be able to cope with the increased traffic? What about so many ISPs offering cap on the data, how will it cope in that case? How can I get hold of femtocell? How much does it cost? Is it available online? 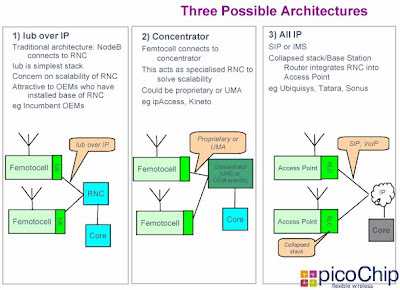 Finally if you want to read some papers on Femtocells, check this picochip paper on "The case for home base stations". You can also find out who is working on femtocells here and here. Picochips library of articles here. This article from computer world is good for beginners. Saw this new book on Mobile TV "Handbook of Mobile Broadcasting ". Mobile TV has been discussed for long time now but its surprising to see that none of the actual broadcast technologies is being actively used. There are small pockets here and there but no proper deployment. Here is UK, Mobile TV is actually TV on demand which is streamed onto our mobiles. Is it much different in other places? 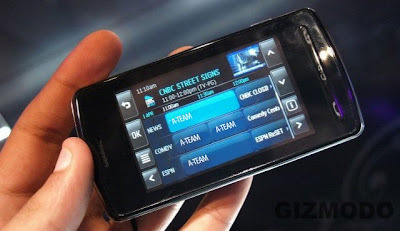 I did write a blog earlier titled '2008 may finally be the year of Mobile TV'. The book mentioned above gave an interesting comparison of the 4 main technologies which is shown above. I would have liked it to expand it slightly by including DVB-SH and S-DMB. Finally, heard that ALU trying to do some work on DVB-SH. See this. 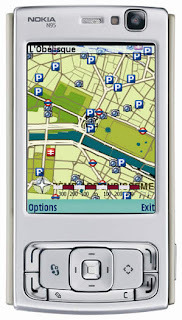 GPS phones are sent to become common with Nokia announcing that it plans to sell 35 million GPS phones in 2008. "We expect to ship about 35 million GPS-enabled Nokia devices in 2008, which is equal to the entire GPS device market in 2007," CEO Olli-Pekka Kallasvuo told the annual shareholders' meeting. Nokia's $8.1 billion acquisition of U.S.-based navigation firm Navteq, which is still pending regulatory approval in the European Union, is a good deal, Kallasvuo said. "When we look at it with the eyes we have now, when regarding pedestrian navigation, map services, digital maps, we are even more excited about the opportunities than when making the decision," Kallasvuo said. Most phones sold this year go to customers who already have a phone, and Nokia CEO said: "Globally, we expect replacement sales to represent more than 70 percent of the industry's volume in 2008." The Finnish cellphone maker said recently it is set to introduce many new phone models through U.S. carriers in coming months to grab a bigger share of the market there. Kallasvuo said he sees better times ahead for Nokia in the United States, where according to the research firm Strategy Analytics its market share has collapsed from 20 percent to 7 percent over the past two years. This compares with Nokia's own estimate of a 39 percent global market share in the first quarter. In the wake of personal navigation devices’ success, cellular carriers have started to offer on-board and off-board navigation solutions, as well as a range of LBS (Location Based Services) such as friend finder and local search on GPS handsets. Community and social-networking-related functionality, such as the sharing of POIs (Points of Interest) and geo-tagged pictures, is also becoming popular and is expected to boost GPS-enabled handset uptake as carriers, handsets manufacturers, and service providers look to capitalize on the LBS trend. However, as GPS begins to penetrate lower-end phones, the cost, power consumption, and footprint of GPS chipsets will have to be further reduced. This will be made possible by single chipset technology and the emergence in 2009 of combination chips integrating GPS, Bluetooth, and Wi-Fi all on one die. Major silicon vendors such as Broadcom, NXP, and Atheros are well positioned to develop such solutions following the acquisition of GPS chipset vendors Global Locate, GloNav, and u-Nav, respectively. At the same time, the thorny issue of indoor GPS coverage has to be addressed, since handset-based LBS services are frequently used in challenging environments with reduced GPS signal strength. Network-assisted A-GPS and high-sensitivity GPS-receivers are becoming key requirements to reduce the time necessary to acquire fixes and to improve location accuracy. ABI Research’s report, GPS-Enabled Mobile Devices, examines the market landscape and future potential for GPS-enabled mobile phones. It discusses critical business and marketing issues, as well as market opportunities and challenges for handset vendors, mobile operators, semiconductor vendors, and other industry players who address the GPS-enabled handset market. This report forms part of two ABI Research Services: Mobile Devices and Location Aware Services, which include a variety of Research Reports, Research Briefs, Market Data, Online Databases, ABI Insights, and Analyst Inquiry Support. Lets hope we dont see too many people with similar problems everywhere. While we can see that the technology in mobile phones have advanced significantly, its still lagging on the battery front and there is no 'Duracell' solution for phones yet. Nujira originally designed its RF power modulation technology to increase the efficiency of 650W power amplifiers in 3G mobile basestations. It is now working on a lower power version which should reduce cost and improve power efficiency in next generation 3G LTE (long term evolution) mobile phones. According to Haynes, the company’s technology, known as HAT (high accuracy tracking), could more than double the time between charges for next generation mobile phones. After a period when handset battery life has steadily increased with more power efficient designs, the situation could be reversed with the next generation of 3G LTE multimedia handsets. 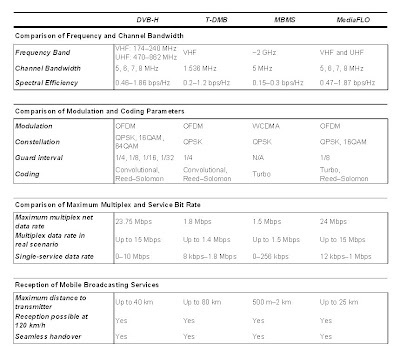 According to Haynes, there are as many as 14 frequency bands - ten FDD frequency bands and four different TDD frequency bands - defined in 3GPP that can be used for LTE, and it is likely that more bands will be added to this list such as 700MHz in the US. As current power amplifiers (PAs) can only efficiently cover one or two bands a large number of amplifiers will be needed in a multi-band 4G handset. “Already 3G handsets can have as many as five power amplifiers,” said Haynes. “So a cost effective wide-band RF power amplifier is a key enabling technology for the creation of 4G handsets and our technology will make it possible to replace five or six narrow-band PAs with just one or two wide-band power amplifiers,” said Haynes. The technology has already been proven in the basestation market where Haynes said the company has contracts with 10 basestation OEMs. For basestations Nujira has designed a high efficiency, high power DC-DC converter module. For the handset market, which is potentially much higher volume, Haynes said the company will look at an IP (intellectual property) approach which will see its technology designed into more integrated silicon designs. Haynes also said the company was developing a version of the power modulator for use in DVB digital broadcast transmitters. 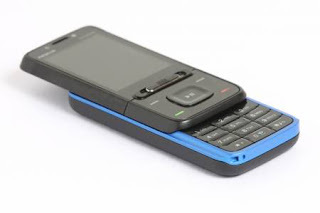 Haynes expects to have its IP-based power modulator for handsets on the market by Mobile World Congress next February. Found this link for Top 100 Telecom Industry blogs. Surprisingly this blog was at No. 60 (atleast when I saw ;)). There are other interesting blogs which may interest you. Have a look here. Fractional DPCH was added in Rel-6 to optimise the consumption of downlink channelization codes. When using HS-DSCH (High Speed Downlink Shared Channel), the main use for DL DPCH (also known as A-DPCH where A stands for Associated) is to carry power control commands (TPC bits) to the UE in order to adjust the uplink transmission. If all RBs (Radio Bearers) including SRBs (Signalling Radio Bearers) are mapped on to HS-DSCH then the DL codes are being wasted. SF 256 is used for A-DPCH and so every code being used by a user is seriously depleting the codes available for other UE's. To overcome this F-DPCH is used so that multiple UE's can share a single DL channelisation code. The limitation is 10 UEs in Rel-6. For several users, the network configures each user having the same code but different frame timing and, thus, users can be transmitted on the single code source. The original timing is thus retained which avoids the need to adjust timings based on Release 99 power control loop implementation. During slots where the DPCCH is not transmitted, the NodeB cannot estimate the uplink signal-to-interference ratio for power-control purposes and there is no reason for transmitting a power control bit in the downlink. Consequently, the UE shall not receive any power control commands on the F-DPCH in downlink slots corresponding to inactive uplink DPCCH slots. Finally, as you may have already figured out, by using F-DPCH the cell capacity has been improved and at the same time for same number of users, the interference has gone down significantly. In Release 7, Rel-6 limitation has been removed. In R6, for a given UE in soft handover the TPC from all F-DPCH had to have the same offset timing. 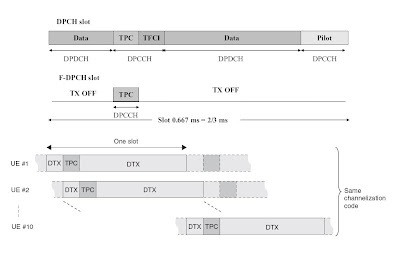 In R7, F-DPCH (TPC bits) can have different timing from different cells. This is possible due to introduction of 9 new F-DPCH slot formats (slot format 0 is the legacy F-DPCH slot format). The RRC signalling is done seperately for slot formats from the RNC to each of the cells. You may also be interested in this Ericsson paper titled "The effect of F-DPCH on VoIP over HSDPA Capacity". Available here.